ThruEat.com is an awesome online resource for backpackers that’s run by two working professionals out of Southern California with a deep passion for the outdoors, and developing the best thru-hiking meals to help them go the distance. Recently, they reached out and asked to review our award-winning Backpacking Kit. Charmed by their beautiful website, and their hard work at dehydrating most of their own backpacking food, we were happy to give them a taste, so they could see for themselves how convenient and tasty Harmony House products are. Their goal is to “develop, test, aggregate, and present ideas for backpacking meals that are lightweight, nutrient dense, calorie dense, affordable and tasty,” so we enthusiastically said yes, and sent them a priority package. When they got it, and tried the Backpacking Kit, they were blown away. Here’s a sampling from their blog about their first time ever using Harmony House dehydrated foods. For the full review, which you’ll want to read for the entertainment and information factor, hop on over to ThruEat.com. Thanks for the kind words, you guys. We’re so pleased you love Harmony House! Harmony House sells a large variety of dehydrated vegetables from sizes in large gallon jugs to single cup pouches. They also have freeze dried fruits as well as meat substitutes like Textured Vegetable Protein (TVP) in a few different “meat flavors.” The available options are a vegetarian backpacker’s dream come true. While they cater to the vegetarian crowd, my meat-eating friends have nothing to fear, veggies are good for you too. Before I gush on any further, I need to disclose that I received a Harmony House Backpacking Kit for free. Actually, I solicited it from them because I was interested in how commercial products stack up to my DIY fare. Much to my surprise they had a package on its way to me in only a couple days from my initial message. For the record, I also reached out to a couple other companies in the backpacking food arena, but no one else responded (not even a “no we can’t give you anything” just completely ignored). So two thumbs up to a company that actually communicates with their customer base. The non-responsive parties shall remain nameless. 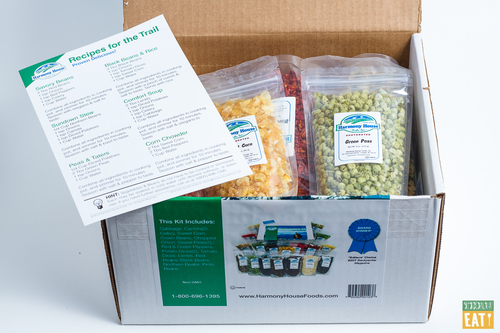 The Backpacking Kit is currently available for $44.96 (or $52.96 from Amazon with free Prime shipping) and comes with 15 different vegetables and legumes (18 pouches in total, you get two bags of carrots, diced potatoes, and green peas). The total rehydrated yield is over 45 cups. Forty five cups! You don’t have to be Einstein to figure this one out, about $1 per cup of vegetables (depending on if you add shipping/tax). To top it off, everything is non-GMO and certified Kosher. 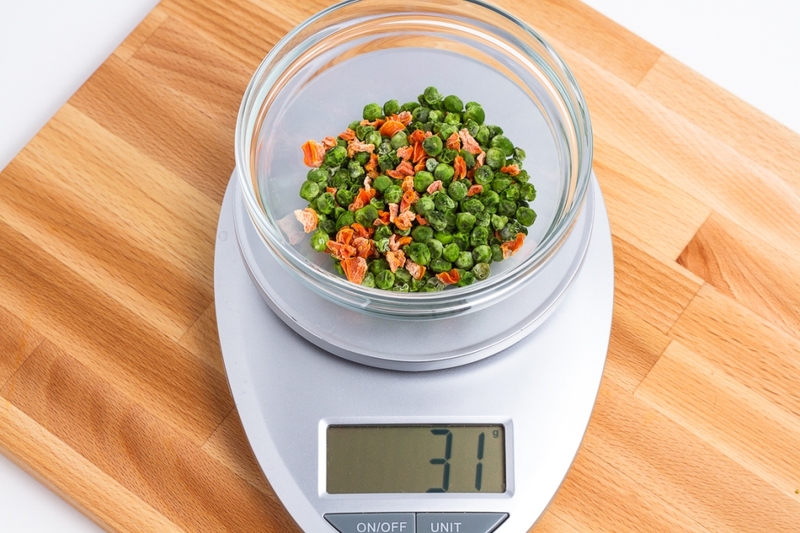 The amount of time, effort, and money involved to purchase 15 different vegetables, chop it all up, blanch it (if necessary), dehydrate (different veggies require different drying times), and package is no small task. Believe me, been there, done that. This would be quite a few days of work and waiting. In contrast, if you’re a huge procrastinator, Harmony House can get shipments to you via overnight FedEx. Good luck trying to accomplish all that at home in the 11th hour. Now let’s talk about the actual vegetables, you can see the list for yourself here. Figuring out what to make with so many things is surprisingly hard, but I’ve tasted them all and my favorite so far is cabbage, green beans, and chopped onions. I’ve eaten them by the handful and spoonful straight from the bag, so much flavor and texture. So what’s the verdict? They definitely make better dehydrated vegetables than I do. Does it matter much when it’s re-hydrated? I’d say not really, I can’t tell that the texture is any better after cooking. However, my non-scientific observation is that their vegetables also re-hydrate quicker. That’s a big deal in terms of saving fuel and time.